The Rynda and Zolotaya Rivers fall through more gentle gradients than the Kharlovka and Litza Rivers. There are some 75 interesting named salmon pools that require the angler to read the water and consider each cast. The successful angler approaches the fishing carefully in intellectual contemplation and, however experienced, listens to the guide. Some say the rivers are reminiscent of Iceland. They, and the accommodation, are attractive to lady fishers as we are to them! Although Kharlovka & Litza have twice the annual water flow of Rynda & Zolotaya – it is a stunning fact that every year Rynda produces nearly as many landed salmon. The difference is that the size of the MSW Atlantic Salmon is likely to be 20% less. A 25lbs fish from the Rynda is more likely to be a 30lbs fish at Kharlovka and so forth. The best fish taken at Rynda was 42lbs whereas at the Litza it was 47.5lbs. The Rynda is a medium sized river that in most heights is ideally suited to a 13ft rod or similar. It has been described as a true fisherman’s river, an intellectual exercise for any salmon angler. Consisting of some 90 pools along its length there are relatively few areas that require long reaching casts but rather a multitude of medium sized pools, pockets, runs and glides. Compared to Scottish Salmon rivers the generally fast flow of the river can be somewhat disconcerting however with the close assistance of the guides you will quickly learn to interpret and read the water and before long it becomes apparent that every boulder or hole, no matter how unlikely, can and usually is a potential Salmon lie. As such it is an immensely rewarding and exciting river to fish. Although the Rynda has a strong grilse run it is equaled by an even number of MSW fish and a 30lb + fish is never far away. Hook into anything in the 20lb and over range and you can expect a thrilling fight that is as likely as not to take you down rapids and runs at a distinctly ungentlemanly pace! Largest 3 Rynda Salmon – 36, 34, 32 pounds. 32% of the salmon were greater that 15 pounds. 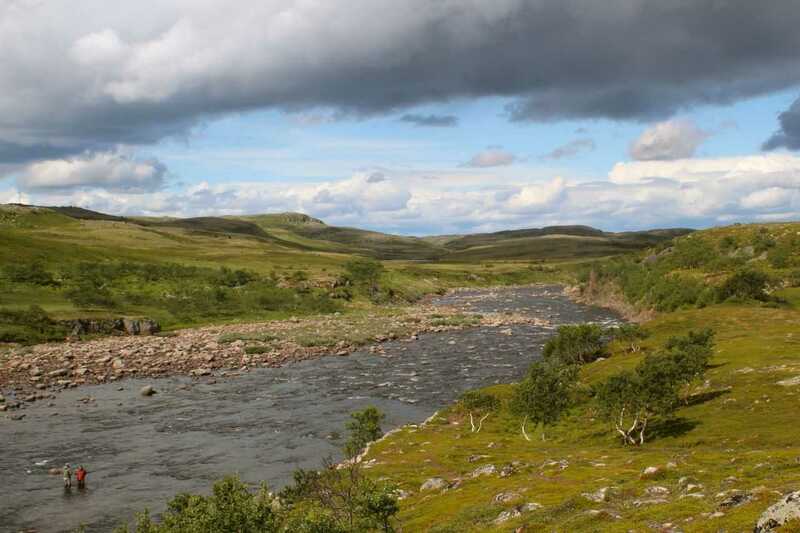 The Rynda river produces nearly as many salmon a season as the Kharlovka & Litza rivers combined. Largest Salmon ever landed was a 42 pounder.